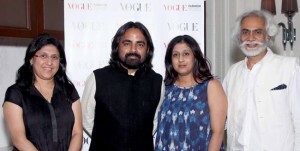 After years of success in several countries, the prestigious Vogue Fashion Fund makes itsIndiadebut this year. VogueIndia, in collaboration with the Fashion Design Council of India (FDCI), is launching this annual event to give centrestage toIndia’s next generation of fashion designers. The Vogue Fashion Fund was originally conceptualised by US Vogue, spearheaded by the iconic Anna Wintour. The judging committee comprises an eclectic mix of fashion authorities, including Sunil Sethi and the Vogue India experts – Priya Tanna – Editor, Anaita Shroff Adajania – Fashion Director, Bandana Tewari – Fashion Features Director and Oona Dhabhar – Marketing Director, Conde NastIndia. The jury also features renowned fashion designers Manish Arora, Sabyasachi Mukherjee and Suneet Varma as well as retail experts like Alka Nishar and Tina Tahiliani. VogueIndiahas invited entries from emerging fashion designers based on pre-defined eligibility criteria. The judging panel will shortlist 20 designers at first from the entries, further narrowing this list down to top 5 finalists based on interviews and the creation of a special capsule collection. The winner will have the opportunity to be featured in VogueIndiaand also win a grand cash prize. Besides this, the design talent will also get a chance to commercialise his/her brand with a leading retailer, and gain access to prominent platforms in the industry like Wills Lifestyle Fashion Week and a one-year business mentorship with an industry professional. Vogue, the ultimate fashion bible, which launched inIndiaon September 22, 2007 is the 17th edition of the ultimate style bible and is a 100 per cent owned subsidiary of Conde Nast International. VogueIndiais a monthly magazine and available across 100+ towns.